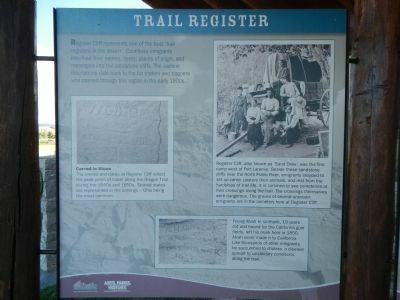 Three panels are located at the Register Cliff State Historic Site kiosk. West of Register Cliff the landscape changes, presenting new challenges for the emigrants. Limited water and rugged terrain made travel more difficult as they journeyed across the plains of southern Wyoming toward Fort Bridger, the next major supply point - 368 miles away. Register Cliff represents one of the best ‘trail registers in the desert’. Countless emigrants inscribed their names, dates, places of origin, and messages into the sandstone cliffs. The earliest inscriptions date back to the fur traders and trappers who passed through this region in the early 1800’s. In the 1870s and 1880s, ranchers and homesteaders moved into this area. Charles A. Guernsey, for whom the town of Guernsey is named, came here in June of 1880, trailing cattle from Colorado. The Guernsey Cattle Company was established the following year with “999” (Three-Nine) as its brand. Captions: (left) Carved in Stone The names and dates at Register Cliff reflect the peak years of travel along the Oregon Trail during the 1840s and 1850s. Several states are represented in the carvings - Ohio being the most common. ; (right) Register Cliff, also known as ‘Sand Draw’, was the first camp west of Fort Laramie. Beside these sandstone cliffs near the North Platte River, emigrants stopped to set up camp, pasture their animals, and rest from the hardships of trail life. Its is common to see cemeteries at river crossings along the trail. The crossings themselves were dangerous. The graves of several unknown emigrants are in the cemetery here at Register Cliff. ; (bottom) Young Alvah H. Unthank, 19 years old and bound for the California gold fields, left his mark here in 1850. Alvah never made it to California. Like thousands of other emigrants, he succumbed to cholera, a disease spread by unsanitary conditions along the trail. 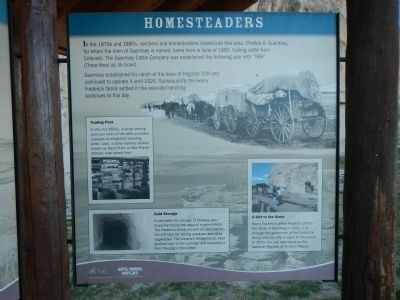 established his ranch at the base of Register Cliff and continued to operate it until 1926. Subsequently the Henry Frederick family settled in the area and ranching continues to this day. Erected by Wyoming State Parks & Cultural Resources. Marker series. This marker is included in the Oregon Trail marker series. Location. 42° 14.871′ N, 104° 42.681′ W. Marker is near Guernsey, Wyoming, in Platte County. Marker is on unnamed road near South Guernsey Road. Touch for map. Marker is in this post office area: Guernsey WY 82214, United States of America. Touch for directions. Other nearby markers. At least 8 other markers are within 2 miles of this marker, measured as the crow flies. 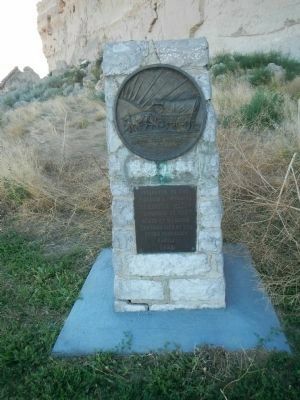 Register Cliff (here, next to this marker); Oregon Trail Memorial (a few steps from this marker); Centre Star Station (approx. 0.3 miles away); North Platte River (approx. 1.2 miles away); Lock and Roll Down a Rocky Road (approx. 1.2 miles away); Oregon Trail Ruts (approx. 2 miles away); The US Army’s Role in Protecting the Oregon Trail is Best Described by the Soldiers (approx. 2 miles away); Oregon Trail Ruts State Historic Site (approx. 2 miles away). Touch for a list and map of all markers in Guernsey. More about this marker. These panels are located at the Register Cliffs kiosk. 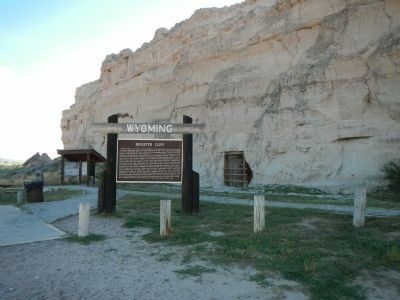 Captions: (center left) Trading Post In the mid-1850s, a small trading post just west of the cliffs provided supplies to emigrants traveling west. Later, a pony express station, known as Sand Point or Star Ranch Station, was based here. ; (bottom left) Cold Storage A root cellar for storage of produce was essential before the days of supermarkets. The Frederick family blasted an opening into the cliff face for storing potatoes and other vegetables. The constant temperatures kept produce cool in the summer and protected it from freezing in the winter. ; (bottom right) A Gift to the State Henry Frederick gifted Register Cliff to the State of Wyoming in 1932. It is through the generosity of the Frederick family that the site is open to the public. In 1970, the site was listed on the National Register of Historic Places. The kiosk is located to the left of the large Register Cliff marker. Note the Frederick's root cellar to the right, now boarded over. More. 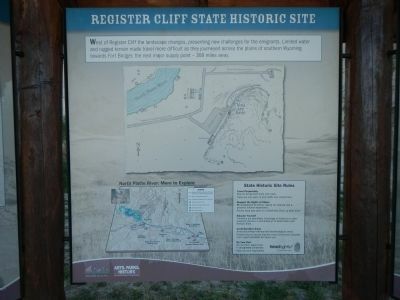 Search the internet for Register Cliff State Historic Site. Credits. This page was last revised on June 16, 2016. This page originally submitted on December 22, 2014, by Barry Swackhamer of San Jose, California. This page has been viewed 419 times since then and 13 times this year. Photos: 1, 2, 3, 4, 5. submitted on December 22, 2014, by Barry Swackhamer of San Jose, California. • Andrew Ruppenstein was the editor who published this page.